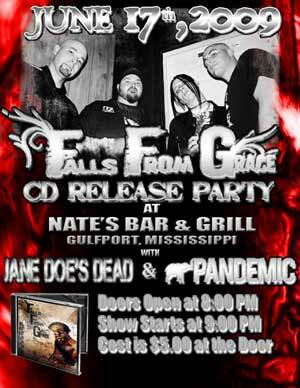 Falls From Grace will be hosting their release party for Pleasure and Pain tonight at Nate’s Sports Bar and Grill on Hwy 49 in Gulfport. If for some reason you can’t make this show, be sure to pick up their cd from CD Baby. Also playing tonight are Jane Doe’s Dead and Pandemic. It’s three great bands for only $5 bucks, so check it out. It’s nice to see a local band have their CD release party locally.